The fire started in the basement of a home on Clark Station Road. Two firefighters got lost and one fell through the floor. All are expected to be okay. 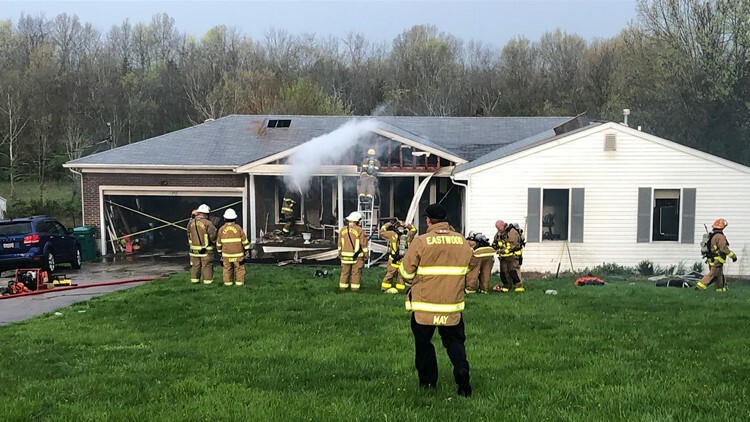 LOUISVILLE, Ky. — A fire that broke out in the basement of an Eastwood home sent at least one person to the hospital Friday morning. According to MetroSafe, the fire was reported in the 1200 block of Clark Station Road. The owner of that home was taken to the hospital to be treated for some minor burns. Fire departments from Eastwood and Middletown responded to the fire. While the crews were working, two firefighters got disoriented in the house and had to call for help. In the scanner recording, you can hear a firefighter yell "mayday" several times. He says that he is lost and he can't find his way out. After a few minutes, they were able to extract those firefighters from the house safely. Eastwood Fire Chief Tom Arnold said that there were several possibilities as to how those firefighters got disoriented in the house, including the heavy smoke. "You absolutely cannot see your hand in front of your face," he said. About 30 minutes later, another "mayday" was issued when a firefighter fell through the floor of a first-floor bedroom into the basement. The fire chief said that the floor was compromised due to the fire. A hole had opened up in the floor and that firefighter fell into it. Chief Arnold said that none of the firefighters sustained any serious injuries and all three immediately went back to work. "They're still over there working. You can't keep them down," he said. Crews put the fire out by 8:30 a.m. The homeowner said that the fire started in the basement, but it is unclear what caused the fire to start. Louisville Metro Arson is investigating.